After last week's day-long charity tournament, I spent the week recovering and licking my wounds. The winds, Mississippi river current, and Northern Pike left me quite sore. My mind was still on my next fishing trip, this one at a slower pace. One of my local fishing buddies and I were looking to get together and hit the water. We discussed and planned to fish my local waters. As mentioned in my previous posts, it has been a tough bite on my home waters this year since the re-freeze during the spawn. However, he had fished them the week prior and said the topwater action was good the week prior. We will meet at dawn. In my excitement to fish with a buddy on my home water, I forget my sonar. On the redundant trip, I notice more bass boats than usual heading towards the lake. I opt to launch at a shallow gravel launch opposite the main launch. My concern is confirmed when I see several bass boats huddling around the launch across the lake. A local bass club is holding a tournament here. I'm not concerned, the kayak is maneuverable, everyone just needs to be respectful of each other. We start our paddle. I take a moment to enjoy the scenery. I love sunrise on my home water. The fog hovers over the water and slowly creeps away as the sun sneaks over the hills. The orange glow increasing as it crawls up the hills and treetops. There is a perfect moment, just before the sun overtakes the treetops when everything is still, glowing a beautiful orange before the fog goes into hibernation, the sun normalizes to yellow in the blue skies. I fish slower, or not at all, in this moment. In this moment, all is right with the world. After my moment of Zen passes, I get back to the task at hand and analyze the tournament boats circling the waters. My topwater addiction has me watching the weed ledge like a hawk. The boats on it are moving quickly, which I know is too quick to pull a fish off of there this time of day. They move off the mat and I start paddling at this window of opportunity to claim this spot. Upon arrival, I alternate between topwater on the mat and cranking the ledge. My Garmin Striker marked fish suspended on the ledge. But I always yearn for those majestic topwater blowups. But I accept the fact that my gut and electronics tell me they are deeper. This is confirmed by my rod doubling over while running my crankbait on the ledge. 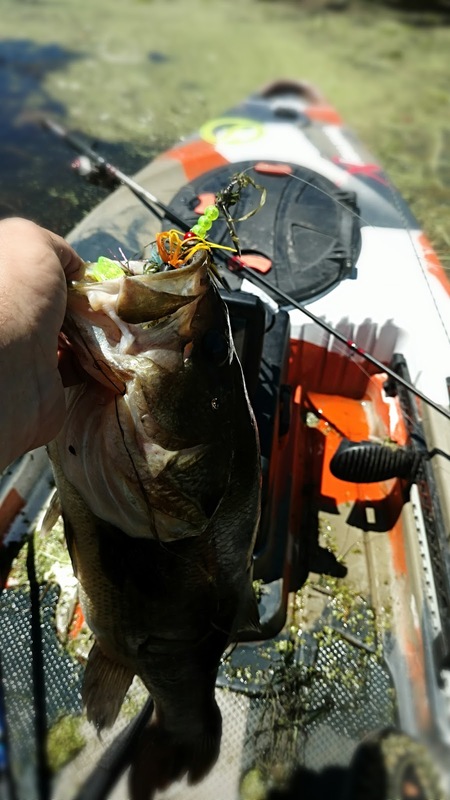 The bass hit on my crankbait's ascend from the depths directly beneath my kayak. My current cranking setup is my backup baitcaster spooled with 12lb mono. I am new to cranking, never interested in trying it before, but Fishing with Phil got me addicted with some great tips on proper cranking. Next year I'll add an official cranking rod to my lineup, but I digress. This rod hasn't bent like this since I caught a 21" Chippewa River smallie in fast currents last year. Just as I'm entering shock from the force of this bass, it exposes its side below my kayak. This is possibly my personal best bass. As the fish rights itself, my 12lb mono snaps and I snap out of my state of shock. This fight had two fatal flaws. I went into shock with a severe case of Bass Fever. Secondly, this backup rod was previously spooled with 50lb braid. I had the drag too tight for pulling in a large fish on mono. I loosen my drag, shake off the disappointment, and tie on another crank. A bit gun-shy from the loss of such a tank, I work the mats. My buddy and I are able to coax some small bass with frogs. But since Fishing with Phil gave me the knowledge to try cranking, it has nearly reached my topwater addiction level. I give into the urge and toss a deep diving crank. I've found a new technique while cranking on a kayak. 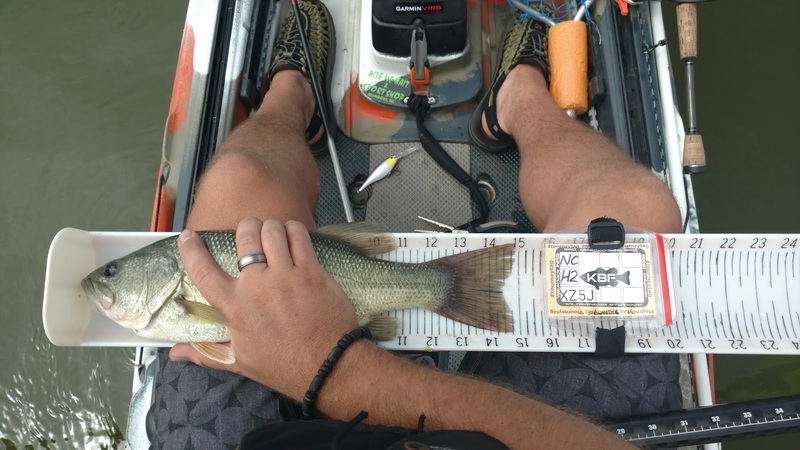 In calm conditions, larger crankbaits will slowly pull the kayak in their direction. This movement also reduces the depth of the crank. 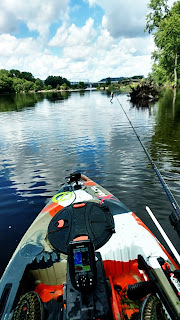 I use the technique to target the fish suspended at 8 feet, working back-and-forth in channels without touching my paddle. 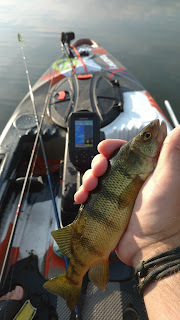 The technique shows successful when I unexpectedly pull a reasonably sized Yellow Perch out of the water. A brave fish biting at a crank 3/4 its own size. We keep working the weed mat into a bay abandoned by the tournament anglers. I work the end of the bay with topwater lures. I miss a couple weak bites and slow my retrieve. The slower retrieve proves successful, fish on! This is a smaller fish, but still fun. I use this as an opportunity to draw some tournament guys. Making a spectacle of the retrieve, I keep the fish low when I verify its length (14"), and let out a "woo!". I tell my buddy, "Look, now boats are heading this way." With a chuckle, we continue fishing. The sun higher in the sky, he suggests trying further in the weed mats. This shallow area is thick and inaccessible by motorized craft. With three boats having now migrated to this bay where I caught my "monster", we glide into the thick mats. A couple casts in, my buddy locates several bass. He pulls two out of the thick within minutes of each other. We enjoy watching the bass boats watch our success outside of their reach. All but one of the boats had been kind and respectful this morning (one of them decided casting right next to my kayak was his best chance of catching fish). We still enjoy messing with them a bit. After fishing the mats a bit longer without success, we head upriver to scout another area inaccessible to boats. Unfortunately, the water is cold and murky from recent rains. The fish aren't interested in feeding. With an ominous sky to the west, and severe storms foretasted, we head back to the launch and call it a day. This was a great trip. The bite was a bit slow, but we both caught a few. I was able to slow things down and enjoy the scenery (and have fun with some tournament bass boats). This is my normal, and I'm happy it is returning after a challenging bite this year on my home waters. 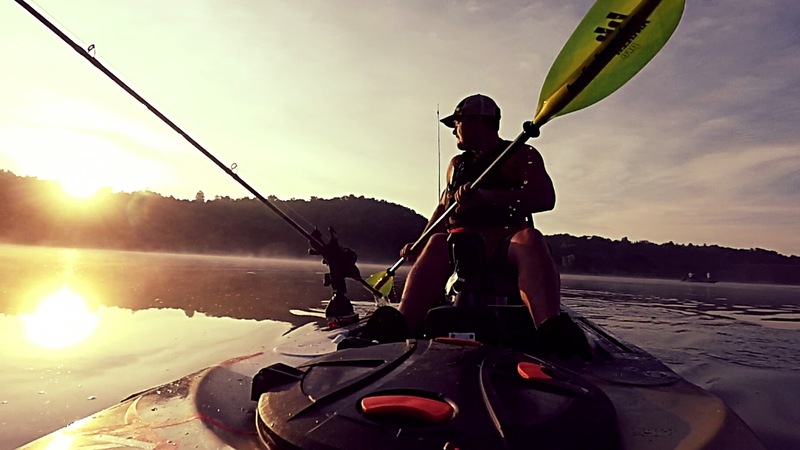 This weekend was the Mountain State Kayak Angler's charity tournament hosted by Kayak Bass Fishing and TourneyX. 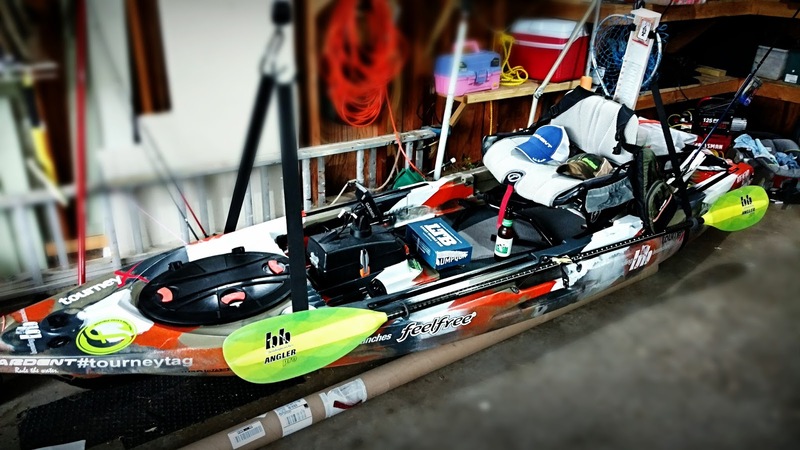 Excited for my first day-long, nationwide tournament, preparations began early in hopes to snag one of the 10 Kayak Bass Fishing National Championship qualifying spots. The preparations began last week with a pre-fish on the Mississippi River. I knew the Mississippi was my only chance of holding a candle to the southern competitors. As documented in the article "Pregame", the pre-fish went well. My location was chosen. Preparations continued this week with a cleaning and application of UV protectant on my FeelFree Lure, which made it sparkle like new. I also re-stocked my Lunkerhunt frog supply to have a few color options. 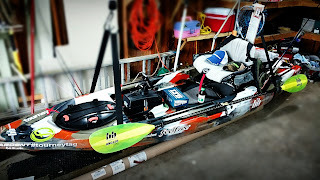 Lastly, I stripped my kayak down to tournament mode (removed my camera poles). I wanted to minimize my accessories to maximize my fishing time. I also knew some of the backwaters required a low profile navigating fallen trees. I loaded everything up the night before, enjoyed a campfire with the family, and went to sleep. I had a hard time sleeping, both excited and nervous for this all-day tournament. The waters proved good last week. But recent local rains, and flooding in northern Wisconsin, made me nervous the conditions may have changed. Nonetheless, I had to roll the dice. The Mississippi was my only chance against the southern bass. My alarm goes off at 4:00 AM (Central Time), and I immediately realize negligence in my planning. The tournament starts at 6:00 AM Eastern and I have just under 1 hour of driving time to get to the river. I thank myself for getting everything together the night before as I scurry out the door and head west. I turn onto the river road that runs along the Mississippi where I catch a glimpse of some backwaters. They confirm my concern, the water is much higher than during the prefish. I carry on, arriving at a launch shortly thereafter. After launching, I immediately head to the pads and mats. First cast, I have a hit. In my half-awake excitement, I failed to notice the topwater hit was not the usual splash of a bass. It was the gulp of a Northern Pike. I reel it in, remove my frog with some disappointment. I'm further frustrated when I notice my brand-new frog was torn by the Pike. Nothing glue can't fix, but not on the water. Since I caught a Pike during the pre-fish, I'm hopeful this means the fish will be active. They were. Over the course of the next couple hours, I find myself battling, and cursing, at the Northern Pike. They are extremely active. By the end of the morning hours, I land 7 Northern Pike and 0 bass. I was able to avoid further frog damage with early hooksets when Pike were hitting, but the damage had been done. To add salt to my wounds, a Pike large enough to pull me and my kayak upcurrent for a short distance took a frog after shearing my 50lb braid clean off. With endless mazes of water, it was time to look elsewhere. For efficiency, I allow the current to carry me towards a bridge while I tie on a new frog. I float under the bridge and paddle into an area dense with lily pads. I test the mats and pads for some time, but the constant noise of jon boat motors starting tell me I'm not the only one not seeing success. I need to figure out where the bass are hiding in the high water. I head back to my original location and paddle against the current. I toss a spinner bait against the rip-rap and run it through the vegetation growing along the rocks. I also pause to try the weed mats again with my frog. The rocks prove fruitless and the weed mats loaded with Pike. I continue my paddle upstream. 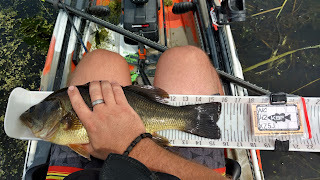 After paddling furiously upstream for a while in an attempt to reach my destination sooner, I arrive at the location where I recently caught a 19.5" bass. Hopeful it may be hungry again, I work the area with a spinner and frog. I receive a few hits, but they were half-hearted hits resulting in no hookups. Carrying on with the paddle, I arrive at down trees. The gates to the main channel. the way to the main channel with no success. It seems this part of the river is echoing the bass bite of my primary location. This entire paddle was upstream. I allow the current to mostly carry me while I try fishing some key spots. After no success, I help the current and head back to my original location. A front is moving in, I hope this brings the bass out of hiding. My analysis proves correct when I land a bass on the first cast on the up-current end of the weed mat. Hopeful the pregame bite has returned, I deploy my drag chain and slowly work the mat. Shortly after the first fish, I get several other hits. However, they are also half-hearted. The bass are not as interested today, but they are back. 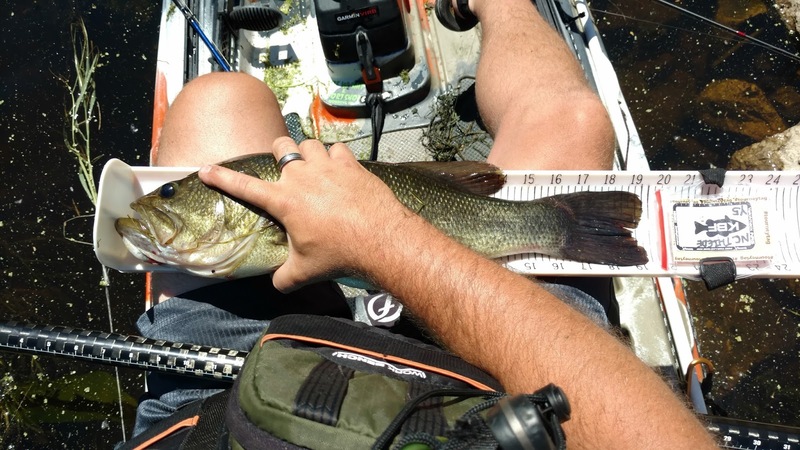 I continue dissecting the mat when a beautiful, large, bass launches out of the water. A classic, epic, topwater explosion. A blur of weeds, water, black, and silver-stained-copper Mississippi bass. I set the hook, and it is a tank. I glance at the clock. One hour from tournament end. I still have time to bag three fish to put me in the running. As this thought crosses my mind, my line abruptly stops. The bass hung me on an underwater structure. It comes free and I continue my epic battle, oddly easier than when it first started. I learn the ease came from the bass spitting my frog. I completed the battle with a healthy quantity of vegetation. I'm frustrated, but keep my cool. I still have an hour. I continue to paddle up the mat and float it back two more times. I have a few hits, but nothing willing to commit. 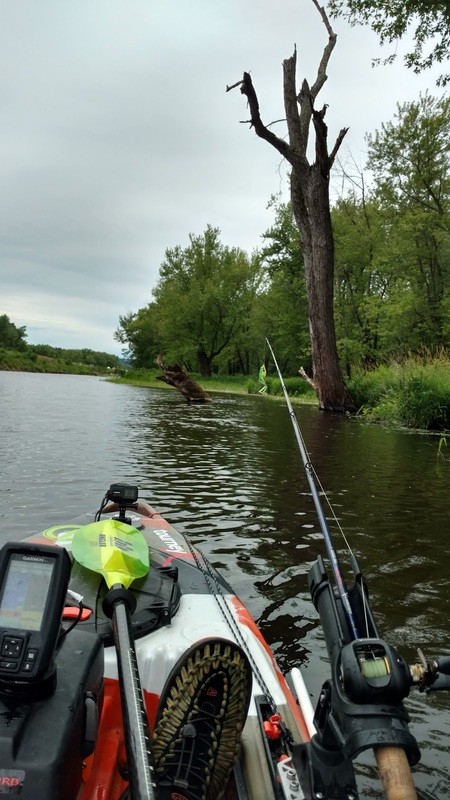 With 10 minutes left in the tournament, I allow the current to carry me unabated towards the landing hoping the vegetation and timber in the channel will supply some last-minute bass. I'm able to get a hit, but nothing landed. I arrive back at the launch defeated. The "shoulda" moments run through my head as I shake it off. I had a great time fishing, caught some nice sized fish (albeit the wrong species), got my first one day tournament experience, learned some valuable lessons, and did this all for a great cause. Today was a good day. Extremely sore and tired, it was time to load up, cross the river for a family event in Minnesota, return home to lick my wounds, and start preparing for my next day-long tournament. After fishing my home water with some new success (read about it here: http://www.smallcraftfisherman.com/2016/07/addicted-to-crank.html), I text my wife to check the weather over by the Mississippi river. Severe storms were rolling through the area and my data connection is limited. She confirms a chance of rain-only forecast. Though exhausted already, I make the paddle back to the launch, load my kayak and gear, and start the 1 hour drive west towards "Vikingland", as my daughter would say. The drive, though long is beautiful. The river road follows the Wisconsin border along the St. Croix river until it meets with the Mississippi in Pepin, Wisconsin. Large bluffs and scenic outlooks line the banks, making the drive enjoyable. Staying on the Wisconsin side, I enter the sloughs of the Mississippi. I'm not entirely sure where I'm going to fish. With a kayak as my vessel, I drive slowly and look for the most inaccessible spots I can find. I spot a gravel canoe launch. It is steep, treacherous, and leads to a maze of backwaters marked as no wake, no airboat areas. Perfect. Having cheated on my frog this morning with a crank bait, I owe it some action. The wheel in the keel of my FeelFree Lure handles the otherwise sketchy launch with ease as it slides into the copper-colored water. I am greeted by the river with a head current and head wind. I have a feeling it will be worth the extra paddling effort. Given some personal commitments this week, this will be my pre-fish for the Mountain State Kayak Anglers benefit tournament on July 16th. I'd like to snag one of the 10 KBF national championship qualifying spots up for grab. A long shot since its nation-wide. The Mississippi is my only chance at holding a candle to the southern bassers. In an effort to locate the fish quickly, I alternate between a spinner and frog. I work the banks, rocks, a tree I tagged "Creeper Tree", grass, and other vegetation without success. Pushing into the wind and current, I head deeper into the slough. I round a corner out of the woods as the sky lightens (I think angels sang "Ahhhhhhh! "), revealing my paradise. Grass, pads, reeds, mats, and other vegetation inaccessible by boat as far as I can see. I send my frog a wink. It dances at the end of my Ardent topwater rod with anticipation. Forget palm trees, white sand, blue water, and margaritas. Paradise is copper water in a swamp with a kayak and hollow body frog. I enter the thick vegetation. A few boats pass and stare from the safety of the deep channel as they watch me work the frog while navigating the weeds with ease. A few casts in a fish attempts at my frog in three rapid hits. No hookup, so I give it another toss, slowing my retrieve. I pause near the blowup hole and another appears under my frog. Another hit, but no hookup. A few more tosses and I have determined the fish has given up, likely a bit small to inhale the larger frog. I work my way around the reeds. The water is warm and shallow, near a channel with current. I'm likely too deep in the shallows to get a mid-day frog bite. Staying in the weeds, I inch closer to the channel watching the water closely. I then spot gold in the water, minnows. I follow them further towards the channel and decide to get close enough to the edge of the mat to cast just beyond and reel into it. A couple casts in this new spot, a fish makes four rapid-fire hits at my frog. My jaw drops and I work it slower through the same spot. Fish on! I use all the torque of my braided Ardent Tournament reel and topwater rod to haul the bass and 10 lbs. of vegetation to my kayak. I land a reasonable 16.5" largemouth. Though not very long, it is a typically fat Mississippi bucketmouth. A good sign. My next cast produces several hits. I'm obviously on a good-sized school. I slap myself to make sure I'm not dreaming. I'm fishing from a kayak, in frog heaven, on angry schools of Mississippi Largemouth...... I must be dreaming. Shortly thereafter, I land another 16" bass with nice size to it. Not wanting to hit the area too hard, I move further into the wind. Near the end of this section of channel, I wander back into a shallow wooded area. Sheltered by the wind, the water is like glass. I'm thankful I'm in the north because this area would be infested with gators in the south. However, after working some key structures and vegetation, I have no results. Time to check out the rest of the channel. I decide to use the wind and current to my advantage and connect my drag chain before entering the channel. From there, I slowly work the structures and mats towards the current. Shortly after the downcurrent float, I locate another school of bass. My frog is greeted with rapid-fire misses followed by the blowup of all blowups. 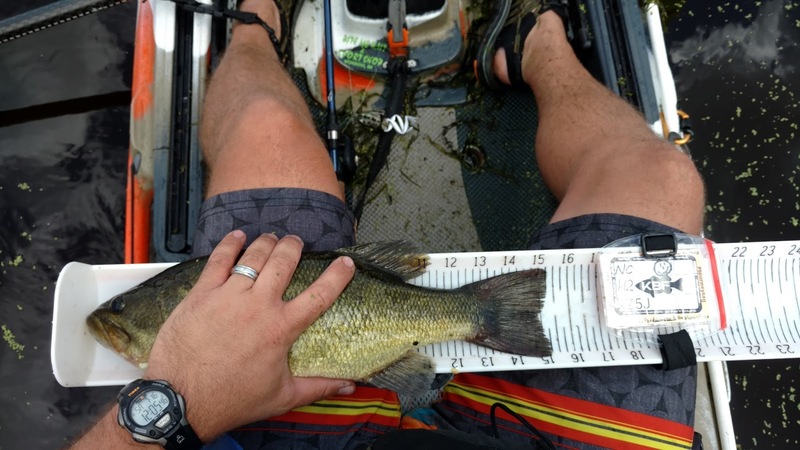 It was an aggressive bass-left-the-water through a weed mat blowup. And it was a tank. My adrenaline pumped, jaw dropped, and eyes bulged as I began to crank the tank and several pounds of weeds until it stopped abruptly, wrapped around some structure under the mat. Or perhaps the entire school attempting to hold the bass back. I have no choice but to release pressure slightly in an attempt to free it. Another pull confirms I'm free.....of the snag and the bass. Though disappointing, I'm OK with the results. I know where the bass is at and I have a week until I'm going to fish it again. I continue my float down the current. Stay tuned to see if this hotspot stays hot for the tournament! I had the itch, the craving, the shakes. After taking a short hiatus from fishing after my week-long fishing adventure, I was itching to hit the water again and needed a fix. The short hiatus weakened my muscle-memorized process of loading my kayak and gear. So I took extra time the night before to ensure I didn't forget any critical gear. Luckily, I noticed my Kayak Bass Fishing regional tournament identifier was still for June. In this "phwew" moment, I printed a fresh July identifier and slipped it into my TourneyTag. I was ready for an early rise. My alarm woke me while it was still dark outside. I roll out of bed, get my stuff together, and jump in the car. I head to a local gas station to get the lunch of champions (Lunchable Pizza and pre-packaged Italian sandwich). Upon exiting the building, I realized a fatal flaw in my planning activities. In my excitement to hit the water, I hadn't checked the local weather report in 3 days. It was raining. I'm not a fairweather fisherman, I've caught some of my biggest fish in a deluge. But there is a fine line between passionate and crazy. As I look at the radar showing dangerous storms approaching, my passionate side thought about going for it. My logical side seen lightning on the horizon and decided to head home (temporarily). I come home and take a brief nap and spend some time with the family. The weather begins to clear. My next debacle is to decide which water to fish. I am participating in the upcoming Mountain State Kayak Anglers benefit tournament. I'd like to prefish the Mississippi. To keep up with the southern bassers, the Mississippi is a must (and I wouldn't mind one of the Kayak Bass Fishing National Championship spots up for grabs). After consulting with my more logical half (wife), I decide to give my home water a go. The weather report shows additional storms headed our way. Given the poor weather, I'm the only one on the lake. The recent storms and rains over the last week have left the water looking like chocolate milk with crushed mint swirling in it. Given the calm conditions, I try working the dam before the wind picks up. I try some flashy lures including senkos, topwater, spinners, the usual arsenal with no success. The wind picks up and I make the short journey into the wind to the opposite side of the lake. Frogs being my favorite, go-to, lure, I search for the weed mat on the horizon as I approach the ledges where they usually reside. Upon arrival a wave (pun intended) of complete disappointment washes over me. I go into shock. The weed mats are washed deep into the shallow bays. This time of year, bass are rare in those areas. They hold on the ledges foraging on the bait fish hiding in the adjoining, now non-existent, weed mats. The water is too choppy to attempt a frog or topwater. 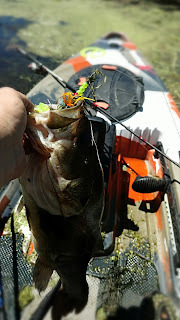 In my state of shock, I place my frog rod back in my kayak's rod holder. I may have cried, I don't recall. Snapping out of it, I take a moment to think about the situation. My home water, historically a fishery producing tank bass, has been terrible since the re-freeze during the spawn. That coupled with additional pressure and the fish patterns from the last few years are gone. I've spent countless hours on this water learning every structure, ledge, depth, and fish patterns. I decide this is the problem. I knew the water so well, I expected amazing results based on the previous 2 years of patterns. When these no longer work, I quickly frustrate. I come to the realization I need to treat this like new water. My moment of enlightenment is followed by a stare-down with my tackle trays. I have a good selection of tackle. Surely I can come up with something new. I force myself to put my go-to trays away (spinners and topwater) and look at what remains. I have had good luck with hard swimbaits in the past, but I also use these often. Next to my swimbaits, two lures catch my eye. Since I'm attempting to think like a fish, I hope they will do the same for a nice bucketmouth. I grab my crankbaits. Forgive me fish Gods for I have sinned, I only own two crankbaits. I have always wanted to try cranking but I'm addicted to frogs....so they have always waited patiently in my swimbait/jerkbait tray. Recent videos on cranking by Fishing with Phil further peaked my interest in cranking. My backup baitcaster is spooled with the recommended 12-pound mono and nothing else is working. A perfect opportunity to really try cranking for the first time. A simple execution of "Eeny, meeny, miny, moe" decides on the silver and purple flicker shad. I glance at my frog sitting idle on my frog rod in my rod holder. It is glaring at me, fully aware I'm cheating on it. I ignore him, set my reel's brake, and give it a toss. Cranking for the first time was like the first time I ate sushi. At first I frowned at the idea. Then when I decided to try it, my face frowned with doubt. As I am reeling, I start to nod my head and smile slightly with approval. I could get used to this. I force myself to slow the retrieve. My backup rod is a 6'6" medium action with a 7.1:1 ratio, not the ideal cranking rod but it'll do. I allow the wind gusts to push me through the reservoir's channel, near the ledges where my frog and I used to enjoy majestic topwater blowups. Keeping my eye on my Garmin Striker, I am watching for two things, fish and speed. The wind is blowing me a reasonable .6 MPH and I notice an increase in baitfish at about 9 feet. Shortly after, larger fish appear. Though excited, I force myself to keep the retrieve slow. As I drift through this plume of fish, I feel several hits. Still not entirely convinced cranking is for me, I assume them weeds. The next cast, I get a large snag that begins to move. Fish on! I had a devious smile spread across my face like The Grinch. I've been bit by the cranking bug. I quickly reduce my smile because my frog is still watching and I need to concentrate on landing this fish. I land the fish. It is only 15.00", but a fat one. This body of water typically produces fish in the 16" - 18" range, but they are deceiving. They are the primary predator in this water and have an impressive weight to them. I continue working the ledges and flats but the clouds are breaking and the wind gains momentum. Whitecaps slap against my kayak. The bite has turned off. Satisfied with this start to cranking, I decide I must make the land, load, drive, unload, launch journey at my upcoming tournament water. Time to hit the Mighty Mississip'. I had just ended a fun week of fishing. Though fun, it was tough. My local waters only produced dinks. Still fun, but no help to my standings in the Kayak Bass Fishing Regional Challenge hosted by TourneyX.com. 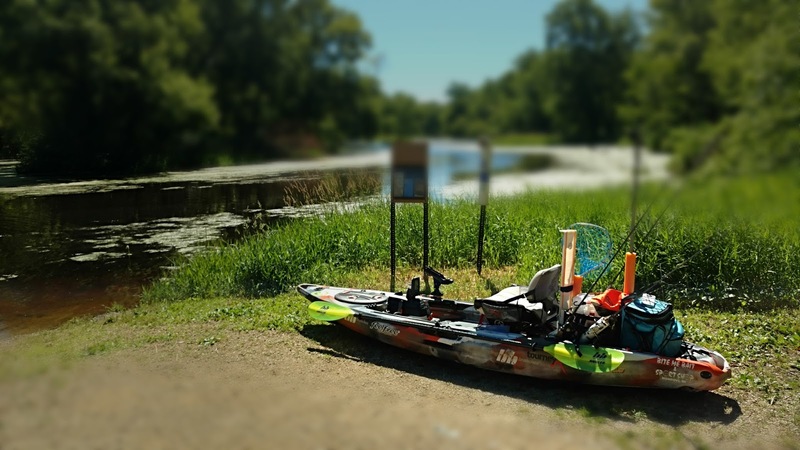 The sport of kayak fishing is quickly gaining popularity. This is clear by the increased participation in the monthly regional tournament. Given my dismal ranking, my goal was to get back into the top 10 in a final push. I fished the Mississippi down by LaCrosse, WI with family years ago. Often hooking some monster Northern Pike, Sheepshead, Catfish, and Bass. Bassmaster continuously puts the Mississippi pool 4 down to LaCrosse in the top 100 lakes noting the number of high-quality bass it offers. Along with praise of the Mighty Mississip' from an angling family member, I decided it was the perfect place to up the ante. Morning-of I'm still recovering for the fishing/fatbiking marathon of the week. I expect fish to be catch-able any time of day on the Mississippi so I take my time in the morning. After a breakfast, some morning weekend fishing shows, and coffee I start the short journey west towards "Vikingland" (as my daughter calls it). I approach the road lined with various boat landing options. A few, likely frustrated, Minnesotians are behind me as I slow for each landing. I give them a creeper stare assessing the water, landing, and number of boat trailers parked. After passing a few, I find the perfect one. No boat trailers and a gravel landing. Perfect for a kayak. Some people consider paradise white sand, palm trees, blue water, sunny skies, a beach chair, and their favorite cocktail in their hand. Mine is a backwater difficult for boats to access. It has copper water, both banks lined with algae, fallen trees in the water, and plentiful vegetation just under the open water. It is surrounded with the sounds of crickets, bullfrogs, horseflies buzzing by my ear, and top water blowups in the distance. I'm in paradise and eager to give my favorite lure, the frog, a workout. In awe of the plentiful frogging spots, I begin by running the frog over the algae mats. I try my typical patterns. A faster retrieve followed by a slower, typical, hollow-body frog retrieve. The floppy legs on a Lunkerhunt frog allows me to do both. I'm able to cover more water while determining the preferred presentation-of-the-day. I work my way deep into the woods. I'm in narrow, shallow, waters that made the movie Deliverance come to mind. I quickly shook the thought away as I continued to work the water in an attempt to locate the fish. With no luck, I mix things up and move back to the main channel in this area. Hoping the current is holding fish, I work a Texas-rigged Senko around the timber and vegetation with no success. A group of recreational kayakers come by. As per usual, my FeelFree Lure draws some distant internal comments followed by a series of inquiries once they are closer. "Wow - that is quite the fishing rig!" "I can't believe you can stand up and fish on a kayak!" "Man, I would love to watch you haul in a big fish on that thing right now! (Me: Yeah, me too)" "So what kind of kayak is that and where can I get one????" The wind wedged me in an algae mat while answering the questions from curious fellow paddlers, so I take it as an opportunity to cover some more water with the frog. This area is the picture-perfect frogging area. Had it not been for the tough bite elsewhere this week, I would have been perplexed. I paddle upwind and up-current and spot more water through a thick algae mat that winds deep into the woods. Boats have definitely not been back there recently, and the thick forest shields it from the wind. I rely on my Bending Branches Angler Pro paddle to propel me through the thick mat. After a short paddle, I'm out of the wind and in the shallows. The water is covered in algae atop underwater vegetation, the banks littered with down trees. The water is in the high 70s and the water about 3 feet deep. Frog perfection. A few casts in, the water blows up next to a down branch. I hesitate to allow the unknown fish take the frog before I set the hook. After what seems like an eternity, I set the hook. My topwater rig (Ardent Tournament Baitcaster with 50lb braid and a Denny Brauer Topwater Rod) yanks the fish up to the top of the water immediately. It is a small, but respectable bass. My setup dragging it across the water like a tube behind a speedboat, the fish makes a Matrix-like twist and tosses the hook. Frog fishing is a love-hate relationship. I love the action a frog brings. There is nothing like a topwater blowup from a monster bucketmouth. But the visual bite puts the anger at a disadvantage requiring precision hooksets. Due to physics of the bite, always difficult. Having cause a commotion, I move deeper into the woods and toss the frog under low branches into some grass growing out of shallow water. A couple twitches of the frog produces a massive topwater blowup. I give it another eternity, and set the hook. I can feel the fish pulling. Hard. With a smile on my face, the line quickly stops. With the confidence you'd expect from someone fishing from a kayak with 50 pound braid, I give it a firm pull. The line begins slowly moving. It seems lighter. Perhaps the fish got knocked out on a log? I see a small wake in the water followed by a large chunk of vegetation and a few sticks. The fish wrapped me around some timber and spit the hook. I spent the last half of the epic battle fighting wood and weeds (we've all spent time battling snags, rocks, logs, and weeds). I realize the same fish isn't going to bite again but spend a few casts trying different retrieves while crossing my fingers and toes. No luck, I move deeper in the woods. I continue working the grass and mats with no luck. I switch to a poppin' hollow bodied frog and spend a bit of time working the same area with no luck. Knowing I'd increase my odds of hooking into a Northern Pike, I tie on a Livetarget Sunfish. I have had my eye on these lures for a long time. Having seen many bass chasing bluegill and ignoring other lures, I figured they would be perfect. This lure is a hollow body lure that looks like a bluegill. You work it on the surface like an injured/dying bluegill. When I visited Dakota from Bite-Me Bait and Sports Shop, he told me they worked well and were ultra-realistic. Well, he was correct. As I work the lure through the mat, I hear an odd noise. I look to my right and watch an owl swooping down from a tree. A beautiful creature not often seen in the middle of the day. As I admire it, I realize it is headed for my lure. I attempt to pull my lure out of its path. But it is too late and the owl too swift. It grabs the lure. In shock, it takes me a second to realize what happened. I then release my spool. The owl had crashed into the water. It awkwardly, but casually, floats in the water. He is staring at me like Robert DeNiro stares at his enemies (in any movie he was in). Sure the owl is ready to exit the water and rip my face off with its razor-sharp beak and talons, I slowly grab for my clippers to cut my line. As I'm about to cut it, the owl takes off and flies/swims its way to shore. It flies behind a large tree, it appears to have tossed my lure. I give the rod a pull and learn my line is tangled in the tree the owl flew around. A few pulls and I'm able to free it and the owl flies into the branches of a low tree nearby. At this point, I realize the owl is not in pain and not looking for retaliation so I need to cut the line as close as possible to mitigate the chances of the owl becoming tangled in a tree until it frees itself from my lure. I quietly paddle ashore and cut the line. Immediately the owl takes off from the branch into the woods. I take a few moments to inspect the area. I never leave fishing line behind. Other animals can get tangled in it. I'd also like to find my lure if the owl dropped it. I find some line, but not the lure. Still in awe, I'm relieved the owl and I both got away safe. The owl showed no signs of pain, just confusion, so that is good. I make a call to the Wisconsin DNR to report the incident. They agree I did the best I could and I confirmed the owl flew off. Had the owl been trapped, they would have sent someone to help rescue it. They did notify the local wardens so they would be aware of the incident and owl should they receive reports or find it. You can watch the events unfold here: https://youtu.be/xgmDvBSKycU. After sending a few unbelievable texts of the occurrence, I refocus. I'm down a lure, but the owl and I got away safely. Time to find a bucketmouth. My angling family member called me when I texted him the owl news. Obviously, he was curious to learn of the event right away. After recounting the events verbally, he gave me some ideas of spots to catch fish (he is familiar with these waters). I make my way in one of the suggested directions. On the way to my new destination, I come across a channel with current and long grass just under the water's surface. The water depth is 6-8 feet. The frog is not the meal of choice today, so I decide to mix it up. While visiting Bite-Me Bait and Sports Shop, a rack full of beautiful lures caught my eye. The owner, Dakota, told me the story of Alex Piontek, a 7-year-old who designs these lures. He and his dad hand-craft them and sell them. Alex, at 7 years old, also fishes tournaments in an older boat painted like the General Lee against other anglers in top-of-the-line bass boats. An amazing story. I immediately grab three of different colors. I decide to toss the James Gang Lovertail 2 with a bluegill skirt. This high-quality skirt preceded by an inline spinner and followed by a weighted hook and paddle tail, is beautiful. The spinner shines in the water, the blue, purple, yellow, and black skirt flutters behind, and the paddle tail looks like a flapping tail. Best of all, it is weedless so I'm able to run it through the long grass in the copper water. Second cast, I get a hit but I miss the hookset. I continue working the grass and timber, getting numerous other hits. I'm unable to land them. They are that cannot inhale the hook (I'm able to see them because I'm burning it just below the surface through the top of the grass to leverage the sunlight adding extra flash to it). My voyage to the new destination is abruptly stopped by down trees. Exhausted, I grow tired just thinking about how to navigate around the barricade. I give into the wind and current, allowing it to carry me back out into the main channel. On my way out, I toss the Lovertail 2 against the timber where I had the first hit. I'm running it through the grass and it abruptly stops. I slowly pull as it feels like a snag. Then it moves. I set the hook and start hauling in my prize. I become quickly excited (as you can see in the video of the encounter here: https://youtu.be/Cg8hR_lI4hk) once I see the flash of the side of this beautiful bass. I attempt to draw my net, but fumble. Heart pumping and adrenaline running through my veins, I'm able to flip the toad onto the deck of my kayak. The battle isn't fished, the bass continues fighting for a self-release. After calming the beautiful creature, I stash my net and draw my Hawg Trough. Eager to see how big it is, I put the bass on the trough and hold it firmly. I quickly adjust my TourneyTag holding my tournament identifier and snap a picture. Taking a few moments to admire this 19", fat, beauty I provide video commentary and release it to make more tanks. Happy with my catch, I decide to succumb to the wind blowing me back towards the boat landing. I paddle to shore where a guy is bobber fishing. I initiate the traditional landing small talk with, "Catch anything?" The guy responds, "No, not yet, you?" Prepared for this response, I already had a smirk on my face while I replied, "Yeah, an owl." Being a fisherman he had expected the typical, "Just some small ones." reply. Instead, he did a double-take, "An owl?!?!?!" He listened to the cliffnotes version of my story while I pulled my kayak out of the water. I then answered the usual series of questions about my FeelFree Lure, wheeled it to my vehicle, loaded it, and headed for home. Eager to see what my camera captured. This whole adventure started with an invitation from the owner of Bite Me Bait and Sports Shop. He invited me to come check out his shop. I am also a mountain biker and prefer the knowledge, service, and prices of small shops. This was no different. The owner, Dakota, is an intelligent, kind, helpful, passionate, individual. His shop is impressive. Fronted with a large bass eating a man (check out his Facebook page here for a visual: https://www.facebook.com/bitemybait/), the inside is just as impressive. He is armed with the biggest selection of plastics I have ever seen. He carries top name products of every kind, and has an impressive selection of handmade lures. I thank him for sharing Alex's story and introducing me to his lures. Had I not visited his shop, I wouldn't had such a tale to tell. It started with Bite Me Bait and Sports Shop.